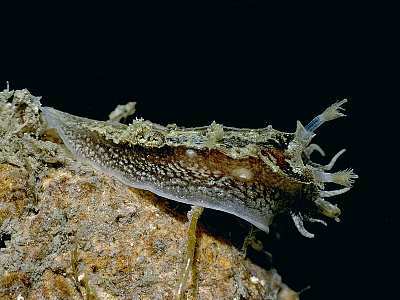 Description: This inconspicuous nudibranch is pale yellow with extensive greenish-brown mottling. Usually there are two patches of darker pigment behind the rhinophores. It has six finger-like processes on its oral veil and up to six pairs of arborescent lateral gills. Adults vary in length from approximately 16-30mm. Habitat: Tritonia plebeia feeds on the soft coral Alcyonium digitatum and is usually found hiding at the base of the colony or amongst bryozoan undergrowth nearby. 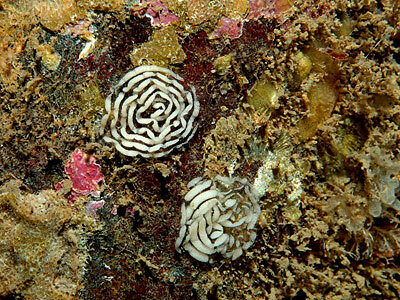 The spawn is a string laid in a convoluted coil, usually on rock at the base of Alcyonium colonies. Distribution: This species is frequent all round the British Isles. It reaches its northern limit at Norway and its southern limit at Portugal. Similar Species: Tritonia plebeia is similar in appearance to Tritonia manicata but not as slender as that species and much darker in colour. Pairs of lateral arborescent gills. Six processes on the oral veil in adults. Picton, B.E. & Morrow, C.C. (2016). Tritonia plebeia (Johnston, 1828). [In] Encyclopedia of Marine Life of Britain and Ireland.